Before you order save the dates and invitations, you might need a custom embosser. Or you might want one. And I am leaning more towards the former because I know it will save you money, time, and hassle. And who wouldn’t want that? Emma here and I wish someone would have told me about a custom embosser while planning my wedding. I knew about return address stamps with ink, and we’ve talked about them at-length in the past. While both options are nice, I have to tell you something: a wedding embosser is a totally helpful tool to have. You only need to buy it once, it never needs replacing, and you never need to worry about smudges, especially on thicker shimmery card stock. In addition, an embosser offers versatility for all correspondence, not just wedding stationery. As a whole, an embosser is a terrific investment at an affordable price. While most things today are done electronically (like announcements done via wedding websites or even email invitations), there are many instances of paper correspondence while planning your wedding. 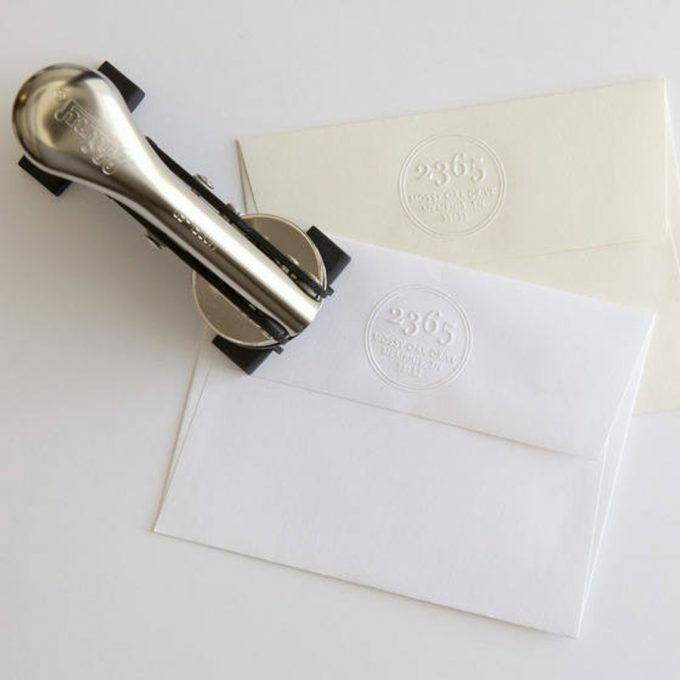 You will need your return address listed on every piece of mail you send; therefore, a custom embosser will come in handy for each envelope from save the date cards and invitations and response envelopes and thank you cards. In addition to its utility, an embossing stamp adds charm and a classy touch. 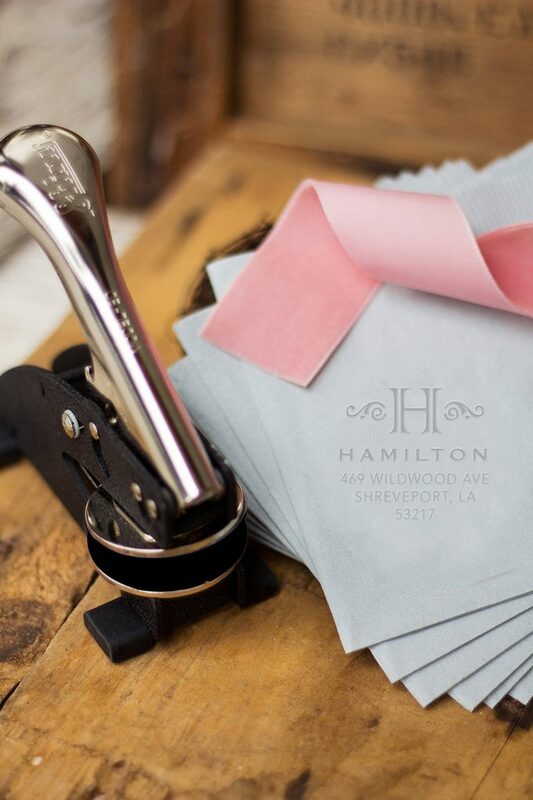 You will love the way an embosser adds your personal mark to all correspondence from your wedding day and beyond. Now that you know why you might want want this tool, we’ll tell you where to buy a wedding embosser. Contrary to belief, you don’t even need to shop at an office supply store to buy an embossing stamp. You can buy a custom embosser online! First, you’ll need the embosser tool. We recommend the embosser from Three Designing Women, as it seems to be an easy-to-use model and all-time-favorite of top magazine editors. You can buy it here with free two-day shipping with Prime. Once you have your embosser tool, it’s time to get your wedding embosser plate (i.e. the embossing stamp that goes inside the embosser tool; essentially, your imprint). We spotted these custom embosser plates, specially made for weddings, at Paper Peach and they fit inside the Three Designing Women embosser tool, as shown above. And my favorite: the fleur-de-lis themed design, shown below. PRO TIP: Use your embossing stamp on the back of your wedding programs to include your address. Guests like to take home programs and, if your address is on it, they will have it on-hand for adding to their address book for birthdays, letters, holiday cards, etc. Buy your own embossing stamp here! Do you want to add an embossed detail to YOUR wedding stationery? Buy your wedding embosser here. P.S. Nicci is awesome! So, now that we’ve chatted about the embosser, did we inspire you? Are you going to add this detail to your stationery? Why or why not? Tell us in the comment box below!